Thank You all for your fab entries to our last challenge which was a real tough one hehe! We do like to get the grey cells working harder from time to time otherwise it wouldnt be a 'challenge' so well done to all those who took part and had a go at it! Well Done ladies for your beautiful creations, please grab a blinkie from the side bar! Some great news too! Lisa, our last special guest Tracy and our first special guest Sheila have all got on the Karen's Doodles UK design team, well done all! Our challenge is A Feminine Celebration so please include a female of any form somewhere on your project. This can include female animals and critters or girls like Anyas, Tilda or perhaps something more arty like flapper girls, a wide choice for you! There are beautiful Hero Arts items including flowers and the new Clings and they also have the newest cuttlebug folders including the gorgeous Jules Jewels. Pop over and have a peek as they have such a huge range of products for all tastes! The Stampman have some new releases imminent and are giving sneak peeks on their blog. I've seen them in their entirity and ooooooooh what a treat! Our DT have come up with some wonderfully varied creations for you for this challenge, thank you ladies! 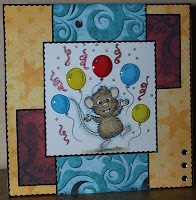 I used a cream A5 card blank to start with. Then I cut the edges of a piece of Laura Ashley paper (Traditional) with my Martha Steward Deep Edge Punch (Garden Trellis) and mounted it onto the card. I stamped one of the ladies from the Delartful Leo's Plate in Ultramarine StazOn and cut it out with my oval Nestabilities (using my Cuttlebug), then matted it onto another Nestie oval in dark blue. The flowers are paper and are from my stash, as are the flower shaped brads. The ribbon is from some I got ages ago from good old Woolworths. 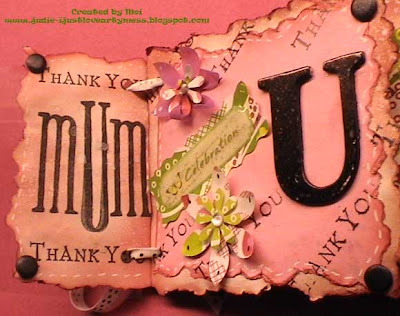 This challenge is for a Female Card, so as Mothers day is at the end of the Week, I have choosen Mothers day. I really went to town on this one, I wanted to do something special for my mummy. 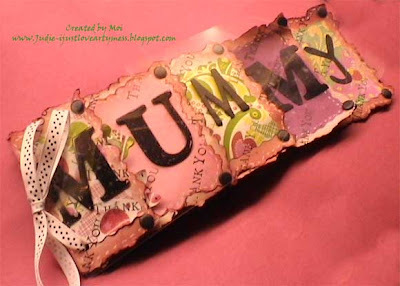 I have created a book card with the letters of Mummy on each page. I have used scrummy papers and lots of Sir Tims distress inks on this, building up each page in colour and shimmer. I used mica powders mixed with inkabilities and sprayed and sprayed, so the colours ran and mixed together. 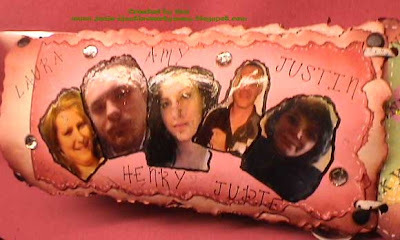 I have included a photo of each of her children on the back of one of the pages. Shes always moaning we are never together, so now she has one photo page of us all. I punched out the flowers from the papers i used. I did faux stitching on all the pages in a white gel pen, just to sort of bring it together. The challenge this week is to use in image of a lady on your card. I knew immediately I wanted to use the smashing papers by Debbi Moore that came with Issue 13 of Creative Cardmaking magazine. 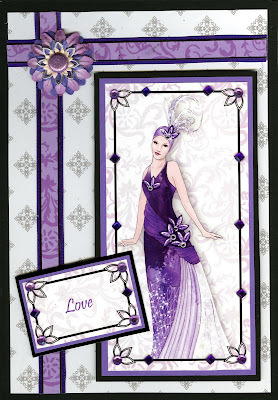 The Art Deco ladies are so very elegant and in particular I wanted to use the purple one in honour of Purple Day which is the 26th March. This is a day to help bring awareness to Epilepsy and all you have to do is wear the colour purple. My beloved husband has suffered with Epilepsy all his life and there is a lot of stigma attached to it due to ignorance of the condition. All the papers and elements are from the paper pack. I have added the patterned ribbon strips to a rich purple ribbon and created a layered flower using Primas, a bead cap and glittered brad. I have created depth with 3D foam pads and added lots of bling to the frame and floral accents in the main picture. I added some punched flowers to the basket and her ribbon in her hair.Then added flowersoft to the basket as well as some falling out of her hand to the ground. I embossed a piece of parchment paper using a cuttlebug embossing folderand then coloured it in with chalks. The pattern papers are from MyMind's Eye - Pretty Please Spring Papers that came free in a magazine.I used Nestability dies to cut the circles. The ribbon is white ribbon that I coloured using R20 and BG34 copic markers. I added gems to the scalloped circle. Then I mounted it on to a card blank I created using scalloped cutter on my guillotine. For this week's challenge I had a request from my Mom's friend to make a Birthday card to a 80 year old Sister, so as it's a faminine theme I thought it would fit the challenge perfect. As you can imagine this called for a different style....one I am not used to but I am pretty impressed with the outcome.I think it's on the lines of " Shabby Chic" and you can find all the detail's for this card in my blog post, with some step by step idea's. The image I've used for this challenge is by Sweet Pea called The serene night. I wanted to keep the colours very soft for a very feminine feel so I changed my usual skin colour choice slightly to keep it soft. Its coloured with promarkers and I coloured the ribbon and leaves to match. I made the bead charm and it has flower shaped beads and cats eyes with a butterfly charm. Our special guest is Cindy Royal who makes the most delightful cards and keepsakes. Cindy is extremely talented and designs for Karen's Doodles, Digital Delights and Delightful Sketches and has been a guest designer for a number of blogs. Cindy uses a wide range of products, techniques and styles on her blog which is packed with inspiration. She also decorates the insides beautifully! 1. 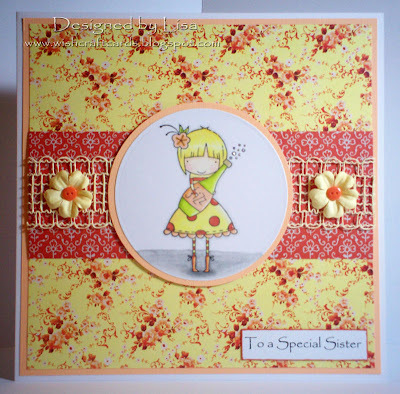 How did you get into cardmaking and how did you get to where you are now? I haven't been making cards all that long. Actually, it's two years this month. I'm not sure what got me started. I've always loved to create and craft and I was just cruising the internet and kept seeing lovely cards using rubber stamps and Sizzix cuts and knew I could have fun doing this. Of course my cards from 2 years ago, consisting of a layer or two of paper and mediocre pencil coloring, are a lot different from my cards of today with multiple layers of cardstock on the front and both inside surfaces, stitching, colored with Copics, cricut cut embellishments, etc. My initial interest in it has snowballed into an obsession! 2. Who's work inspires you and where else do you find inspiration? Oh, everyone's work inspires me. I have hundreds of blogs subscribed to in my Google Reader and I spend a lot of time every day scrolling through it, oohing and ahhing over the creations I see. Even if I'm not overly fond of the total creation or the image, many times the colors or a particular embellishment or technique will shout out to me. They are all great, from the most simple to the most complex; great because they are hand made by someone who loves the hobby as much as I do. Blogs, forums, and galleries are just full of eye candy and inspiration! 3. What are the last 3 items you bought and what did you like about them? I treated myself to a few more Copics! They are just awesome for coloring with shading and the more I use them, the more comfortable and confident I become with them. No one should be afraid to use them or think they aren't good enough. I also love that I can color embellishments with them to match my image colors. Digital Images! Definitely hooked on them! My life is such that I'm really busy with work and family, so my creative time sometimes falls short. I love having a handful of digital images all printed in the sizes I want and ready to go, so when time allows, I can grab them and my Copics and get a little coloring time in. No muss, no fuss.... I'm pretty messy with ink pads and embossing powder! A Cricut Cartridge! I love adding paper cuts from my Cricut to my cards. It's just a nice final touch that often brings everything together on the card or adds a little fun to it. My work space is scattered across a couple of rooms! and a total disaster! I use one main craft table for cutting and assembling and no matter how hard I try, it is always a complex, jumbled mess of paper scraps, tools, embellishments, adhesives, etc. I can clean it up and start out with a good couple of square feet of clear space and by the time I'm a few minutes into creating, there's not even the space of a postage stamp left clear! My tips aren't technique or tool related, but more on the line of your mindset. 1. Don't be afraid to try something new just because you think you aren't good enough. Go for it. Even if it doesn't come out the way you wanted or expect; chances are it will be even better, just different. 2. Go easy on yourself. I'm guilty of being overly critical of my own work, sometimes really not liking the outcome, when it's a perfectly fine card, loved by others. We are our own worst critics. Lighten up. The paper crafting police will not come to get you. 3. Don't like where your project is heading? Set is aside for a while, even days, and go back to it with a fresh look. Many of my cards are colored, cut and laid out for days. I will go back and just glance at it now and then, rearranging or just reconsidering what's been done, before I settle on the final creation, often quite pleased with what I ended up doing. All your cards are beautiful - such diversity. Awesome challenge! Here is my card. Thanks for looking! Thanks for the great challenge! Here’s Mine! This challenge is so apt at the moment. I love the dt examples - well done girls. Some great cards DT. Here is my Card Thanks Gloria M.
Great challenge and lovely cards from the DT! Great challenge and DT cards. ... Joyful Stamper: Curiosity- New @ TSB! Great Challenge!!! Here is my card. I hope I am not to late. Great challenge. Here is mine. Enjoyed reading Cindy's interview, will take some thoughts away from that, and she used some beautiful papers on her card. This is my 2nd entry love the Dt cards! What a great challenge, and such lovely samples from the DT! You can see my entry here. Lovely challenge girls I love anything delicate, soft and feminine. This is my card. Heres another from me, didnt realise I'd already had an entry! My card on my blog. Thanks! Beautiful job ladies!!! And it's a wonderful challenge! 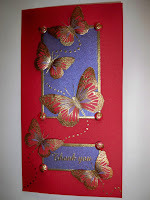 Gorgeous cards girls, fab challenge. Gorgeous DT cards! Thanks for a great challenge. Fabulous work, everyone! Thanks for a fun challenge! Awesome Challenge! Love the DT Samples! My card is here. I entered it for another challenge but it fits so nicely into this one that I can join in here as well. The DT have excelled themselves. Here is my 2nd entry. lovely cards..her is my one..
Loving the DT cards - great inspiration! Wow what great cards. They are all beautiful. Come by Big Mamma's Stamping House right HERE and check out my entry. I just found your challenge for the first time and decided I wanted to enter, love all the DT cards and love how the designers all wrote a little bit of background to each of their projects. You'll find my card here. Great theme this time & even more fab DT cards Here's mine! Great work by the DT. So many gorgeous cards! Here's mine. Great cards. Here is my card. Love the samples by the DT. Here is my third and final entry for this challenge. Women tend to be forgotten as they are always taking care of every one else. It's nice to celebrate ladies! Here’s my entry. Challenge 17 - Spring into Spring!